Super glow spider web material glows in the dark and is the perfect party decoration for indoor or outdoor use! 2.10 oz. 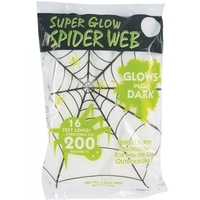 (60g) of spider webs are in each bag. A 16-foot long piece and stretches to cover 200 square feet!